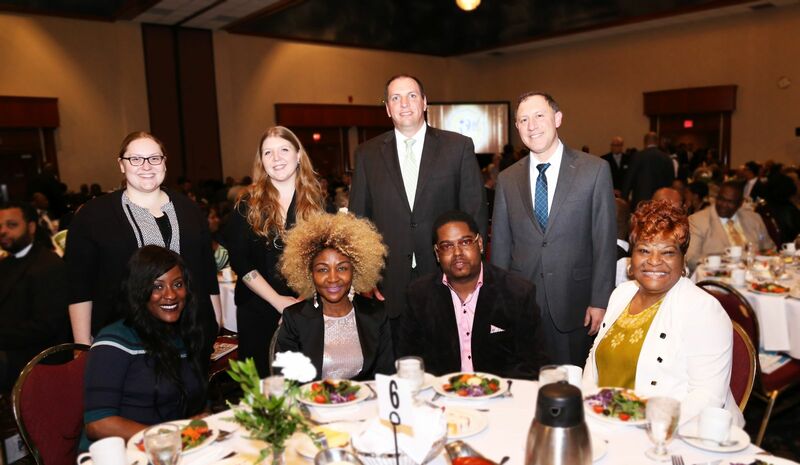 Hupy and Abraham Sponsors Annual Black Excellence Awards | Hupy and Abraham, S.C.
Hupy and Abraham, S.C. continued its tradition of sponsoring and attending the “32nd Annual Black Excellence Awards” on February 24, 2017. Presented by Wisconsin’s longest running black community newspaper, the Milwaukee Times, the annual celebration event is a staple of Milwaukee’s Black History Month festivities. Attorneys Tom Perlberg and Evan Claditis were in attendance, along with Pastor Martha Austin, a friend of the firm. The Black Excellence Awards highlight the work of people otherwise forgotten by the spotlight who work toward improving our communities. Over the years, more than 900 individuals have been honored at this award ceremony. 2017’s theme was “Educating for Excellence” and prided on the importance of teaching young people skills they can use to maintain an extraordinary life. Genevieve Michel-Bryan, VP/Broadcast Director of BLACK ENTERPRISE, a media company, delivered the keynote address. In her speech, she emphasized the importance of journalism and searching for truth in all places. During the program, several community builders were honored for their work and local high school seniors were presented with college scholarships. Hupy and Abraham, S.C. has been an avid supporter of the Milwaukee Times and the Black Excellence awards for many years, and will continue to do so in the future.